Predictive analytics applications use machine learning to build predictive models for applications including price prediction, risk assessment, and predicting customer behaviour. Based on the trainers' book, "Fundamentals of Machine Learning for Predictive Data Analytics: Algorithms, Worked Examples and Case Studies" this course presents a detailed and focused treatment of the most important machine learning approaches used in predictive data analytics, covering both theoretical concepts and practical applications. "The course provided our company with an excellent introduction to the key concepts behind machine learning. Simple explanations of the core concepts and algorithms were provided along with practical worked examples. The course was engaging and interesting and delivered by experienced presenters who brought a wide range of practical experience and insights. I would recommend this course to anybody looking to apply machine learning algorithms in their work"
"In three days John and Brian managed to impart a ton of technical knowledge in a relaxed, interactive manner. They also delivered a comprehensive methodology that allowed me to start right away on data analysis projects based on machine learning. 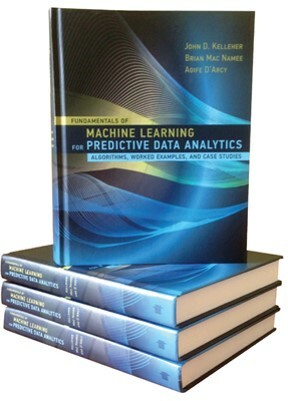 The excellent facilities and course structure were a bonus"
All delegates receive a copy of the book "Fundamentals of Machine Learning for Predictive Data Analytics: Algorithms, Worked Examples and Case Studies"
What is predictive data analytics and what is it used for?